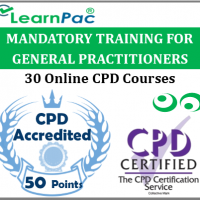 Welcome to LearnPac Systems’ e-learning mandatory training courses (15 online CPD Courses). This statutory and mandatory online training course package was developed to meet the Skills for Health’s UK Core Skills Training Framework (CSTF) outcomes, as well as the Care Quality Commission (CQC) and other relevant regulators’ recommendations. At the end of this e-learning mandatory training course, learners will be required to complete an online knowledge assessment. On successful completion of the knowledge test (80% pass mark), learners will be able to download a FREE CPD certificate that is valid for one year. 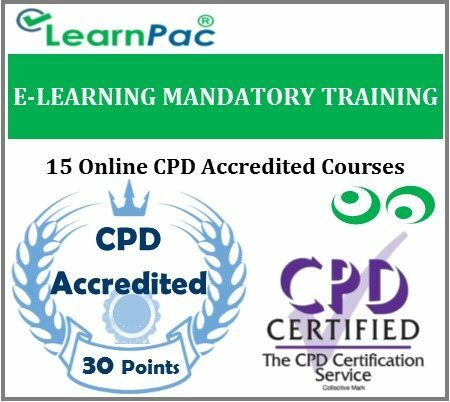 The content of this e-learning mandatory training courses has been independently certified as conforming to universally accepted Continuous Professional Development (CPD) guidelines..
You are in full control of how long it takes to complete the course. You can go through the course in one sitting, or pause and come back later. Your progress will be recorded throughout and you will be able to start where you previously left off. After adding your mandatory & statutory e-learning course (s) to the shopping cart (by selecting Add to Cart), you will be able to make a secure payment using all major credit and debit cards. You can also make a secure payment for your online training courses through PayPal. Once you have purchased your mandatory and statutory online training course (s), you will be sent a confirmation e-mail. You will then receive a link and login details to access your e learning course (s) within 24 hours of purchase. The Skills for Health UK Core Skills Training Framework recommends that health and social care workers who do not have client facing roles may be required to only take some of these statutory and mandatory courses. Please check with your employer which courses you require. The Mandatory Training Group will not be responsible if you take the wrong courses. LearnPac Systems’ candidate mandatory training e learning package covers the main points relating to the CQC recommendations and CSTF learning outcomes. The online courses have additional elearning materials, which provide more learning resources for learners to refer to and apply to practice. Who are these E-Learning mandatory training courses for? LearnPac Systems’ e-learning mandatory training courses should be completed by all health care, allied health professionals (AHPs) and social care staff. This includes voluntary and unpaid staff working in NHS hospitals and private hospitals, locum medical doctors, locum AHPs, nursing staff, agency workers and support workers. These online statutory and mandatory courses can also be completed by health and social care support workers, including those who work for residential home, nursing homes, charities and care home staff. 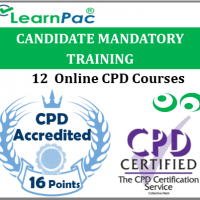 Why choose LearnPac’s online training courses?